The National Center for Education Statistics regularly publishes status high school completion rates (National Center for Education Statistics, 2009a). Researchers interested in gauging the performance of high schools in graduating students on time with regular high school diplomas have noted some of the deficiencies of the NCES status completion rates and have utilized alternative methodologies and data sets to estimate the rate of on-time high school graduation (Heckman and LaFontaine, 2007). The 2008 American Community Survey does not yield graduation rates, and inferences regarding the performance of American public schools may not be warranted. Household surveys such as the American Community Survey are more indicative of final educational attainment and better gauge the success of the entire educational system, including the “second chance” adult education system and correctional facilities as well as public schools. The NCES status high school completion rates are based on the Current Population Survey (CPS) and have two notable features. First, individuals who complete a GED or alternative credential are included with high school graduates as high school completers, and thus NCES does not distinguish between graduates with regular high school diplomas and GED recipients. Second, the Current Population Survey is restricted to the civilian, non-institutionalized population. Using the 2008 American Community Survey, we can quantify the importance of these two features for the measurement of high school completion and high school graduation. The top panel of Table B1 reports the educational attainment of 20- to 29-year-olds for the total population (including both the institutionalized and those in the armed forces). About 5% of native-born Hispanic, black and white young adults have a GED as their highest educational attainment, but it varies by gender. Confirming Heckman and LaFontaine (2007), black males are the most likely to end their education with a GED. The fact that the Current Population Survey is restricted to the civilian, non-institutionalized population is problematic mainly because it omits the institutionalized population. The bottom panel of Table B1 reports the educational attainment of 20- to 29-year-olds in the civilian population. The educational attainment of young adults in the civilian population is very similar to those in the total population. There are not that many young adults in the armed forces to make much of a difference. The restriction to the non-institutionalized population makes more of a difference, particularly for black males. Comparing the educational attainment of the non-institutionalized population (the center panel of Table B1) to the total population, the distributions appear nearly identical for females. But for young men, the non-institutionalized population is better educated because youths in correctional facilities and mental hospitals are not included. For black men, 80% of the non-institutionalized population have received at least a high school diploma, while 76% of all young black men have at least a high school diploma. The difference between NCES-type reported high school completion rates and the high school diploma rate of all young adults can be inferred from Table B2. 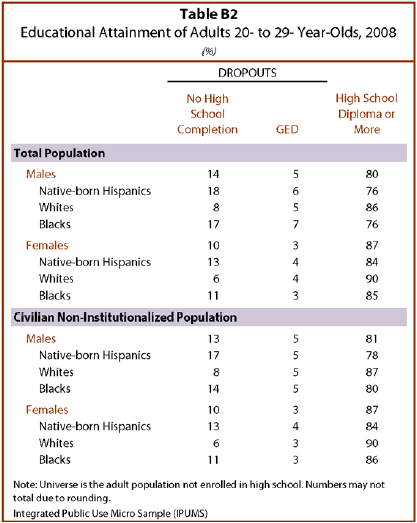 For example, for native-born Hispanic females, NCES procedures indicate that 88% of native-born Hispanic females have completed high school (based on the bottom panel, 4% have a GED and 84% have obtained at least a regular high school diploma), while the top panel indicates that 84% of all native-born Hispanic female young adults have at least a high school diploma. For young women, the difference is almost entirely due to the handling of GEDs. For young men, particularly young black men, both GEDs and the population universe matter. For example, for young black males, NCES procedures would yield 85% of young black males completing high school (5% by GED and 80% by obtaining at least a high school diploma). But only 76% of all young black males have at least a regular high school diploma. That is a 9 percentage point difference, and it is only partly due to whether or not to include GEDs. The exclusion of the institutionalized population matters for young black males. 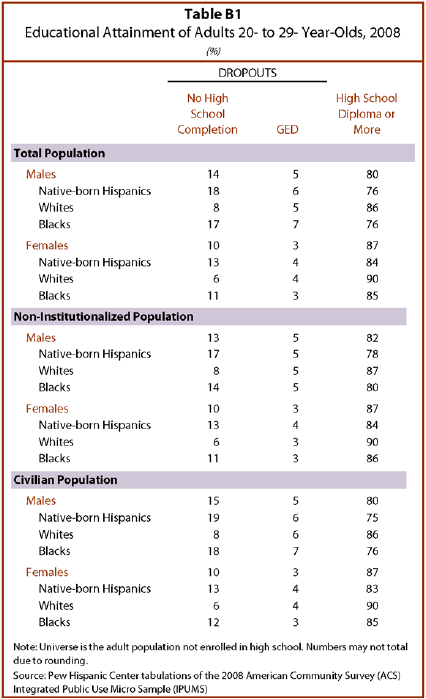 The analysis uses the University of Minnesota Population Center’s Integrated Public Use Micro Sample of the 2008 American Community Survey (ACS). Documentation is available at http://usa.ipums.org/usa/doc.shtml. The year 2008 is the latest one available. The ACS is a 1% sample of the resident population and is designed to collect long-form Decennial Census data on an annual basis. The 2008 ACS data collection is the first year in which the questionnaire disaggregated the responses on the highest level of schooling question to distinguish completing high school by receipt of a high school diploma separately from obtaining a high school equivalent (e.g., GED). In part because of its large sample size, the ACS has become a primary source of data on the educational attainment of the U.S. population. For example, the U.S. Census Bureau now publishes state-level educational attainment data from the ACS in its P20 reports (Crissey, 2009). The National Center for Education Statistics now publishes detailed status high school dropout rates using the ACS (National Center for Education Statistics, 2009b). The sample analyzed herein consists of adults ages 20 and older. Following National Center for Education Statistics’ practice in tabulating high school completion rates, adults enrolled in school and who had not completed high school were excluded from the analysis. Among the foreign born in the sample, in a small number of cases (0.3%) the number of years since migration exceeds the immigrant’s age. These respondents with anomalous data were excluded from the sample. The sample analyzed had 2,220,070 adults: 301,507 respondents who were either not U.S. citizens at birth or were born in Puerto Rico and 1,918,563 native-born respondents. The sample included 236,749 Hispanic adults.